Emperor returns for it's third successive year! Today when I returned back from the Zoo, I popped my new EMP lure out in the garden hanging from a wooden cane and in a black mesh bag. I waited, and waited and waited a bit more. The at 4:55pm, nearly two hours later I was greeted by the sight of a beautiful but confused Male Emperor Moth. This is the 3rd year running i've recorded it here, and my 4th garden record. A few quick photos after netting him and popping him briefly in the fridge to settle, and then he was off zooming across the back fence to 'hopefully' find a real mate this time. Always a joy to see. Garden species no.41 for the year. A modest catch of 13 of 7 species last night. Only new for year was this Epiphyas postvittana. Extremely warm days approaching, but with cooler clear nights, we'll see what turns up as a result of the warm weather and hopefully fresh emergences start to arrive at the garden trap. 4 lifers in two days! 4 lifers in 2 days here in Central Herts. Extremely lucky to get Orange Underwing yesterday whilst out with work (After much deliberation)... which was made easier with another Orange nderwing today to compare with, my first Light Orange Underwing! Crazy, 10 years i've looked for these and 'think' i've seen one or two at the tops of trees before, to get both species fly by me within netting range is just crazy. Also 2 interesting micros today. Mompha langiella, presumed extinct in the County? One netted around Birch today and 2x Heliozela sericiella also netted flying around in the hazy sunshine. Temp upto 18c which certainly brought things out. Other moths were singles of Dyseriocrania subpurpurella, Eriocrania salopiella and Phyllonorycter ulmifoliella. These 4 recent new species for my UK list, takes me to 1506 since 2006. Either would have been a first for me today during a brief walk, a 'Butterfly like' object was seen racing up and down a ride in sunny but windy conditions, it was one of the Orange Underwings and it was a struggle with the net to attempt to capture it to confirm its identity. Back home, a few photos confirms that it is Boudinotiana notha, the Light Orange Underwing, and a Female as well with the less serrated antennae. A little worn but pleasing all of the same. Basil's Park, Central Herts. 15/04/19. The only over find in 20 mins was a lovely purple-shot Eriocrania which is either sangii or semipurpurella. A variety of Eriocrania species out NOW in a variety of woodlands I suspect. Here are three different species seen last week whilst out walking through Basil's Park. Eriocrania salopiella is new to me, these seemed to be in abundance in one area. 10/04/19. Just before going to bed, my wife said that 'There's a moth on the door' and there was indeed, a geo sitting on the french door. Of course as soon as I opened it, it flew off! Armed with a torch and the ever trusty spare net that resides in the garden, I climbed onto one of the garden chairs and stretched gto my limit to net it. A beautiful Streamer it was and species no.38 for the year. This isn't a common moth in my garden with 1 record or sometimes none turning up per year. Frosted Green heralds the start of frosty weather! Just 4 species last night here in Stevenage, North Herts, huge slump in numbers and Orthosia tailing off now here. Quite surprised as it seemed very mild and calm last night with dominant cloud cover. The poor return was redeemed as I got to the second to last egg tray inside the Robinson. Only my 3rd garden record of Frosted Green (With 2 only last year). No trapping recently here, as it has just been far too cold with temps dipping to -1c and light frosts. Garden species count for 2019 now upto 37. My earliest ever Lesser Swallow Prominent last night (05/04/19) by 13 days! Previous earliest (18/04/18). I never get many here, of this predominantly May species. Stevenage, North Herts. Other than that, just 10 moths and down to 2c this am, only other moth of interest was another Early Thorn. Moth species no.36 for the year now in the garden. A chilly night last night and down 3c, it didn't take long to count 12 moths, but... it only takes one moth to make it all worthwhile. There was very little in or around the trap, but peering through the perspex I spotted a familiar moth..a stunning Brindled Beauty. This moth is quite special to me for two reasons. The first, it's only the 4th garden record (With 1 last year and 2 in 2017). The second, the two in 2017 were my first of this species since beginning the mothing journey that started in 2006. Garden species count for 2019 now upto 35. Here are three of my recent catches from my suburban garden, here in North Herts, Stevenage. Numbers have been still pretty crazy for my garden, despite cool temperatures most nights, it hasn't really put the moths off from flying. This is my best March since moving here in 2012 for numbers, but not quite the best for species. I recently sorted my generously donated Skinner trap with some new electrics and painted it to stop it from rotting. I have been using this trap on and off recently, but still using my MV at times as well. Only one New For Year species has turned up in just over a week now, the gorgeously toned Early Thorn. It was great to get another Pine Beauty last night, usually featuring in my trap on one occasion a year, but sometimes missing, to get two this year is great, I compared the photos and luckily it's not the same returning specimen from a few weeks back, although a little tatty on the termen...I thought it was! Still a huge lack of micro moths this year so far, which is a tad disappointing. Here are my recent lists from last week. Garden species count for 2019 now upto 34. A small Moth was spotted flying in the early morning sunshine before I went to work, as I always have a net on standby in the garden, I quickly reached over and grabbed it and netted it first time. It was a Mompha species and resembled Mompha jurassicella, a rare moth here in Herts, and one i've encountered twice before in my garden. 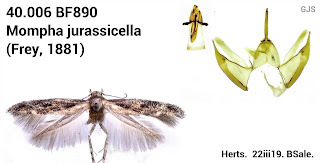 The moth was whisked over to Grame Smith, whereby it was confirmed as indeed, Mompha jurassicella. This made it moth no.33 for the year. 20/03/19 - Pale Pinion New for year here in my Stevenage back garden, North Herts. My usual one annual record..probably! Moth species no.32 for the year. Yesterday afternoon I found not one, but two Brinded Pugs that I had missed from Friday night's catch. Both were tucked right under slats on our fence panel. One was very tatty, but at least the other one was smart enough for a photo. Nice and fresh moths still emerging it seems, a rather large Small Quaker, as big as some Common Quaker's and in bleary eyes my thoughts were of Blossom Underwing...not to repeat last year's record yet sadly. And a smart Clouded Drab, still waiting for Lead-coloured here this year. New for year Diurnea fagella on Thursday night (14th March), was nice to get.. Moth species no.30 for the garden in 2019. There were 24 Common Quaker's here last night, roughly half of my highest ever count two weeks ago during that mild and calm spell, but still a really high count for my garden in one night. The variation continues to astound me. The unsettled but mild weather is set to stay for a while, towards the end of next week we could be in for slightly warmer and more settled conditions. Garden species count for 2019 now upto 30.